(stick rotates camera when possible). In-game it brings up a save screen. B - teleports the character to a corridoor. B + direction - teleports elsewhere. X - makes the character climb in mid-air. (then gets stuck so you have to teleport). Y - adds a debug overlay to the screen. Start cycles through debug modes 0 to 5. Using the L trigger changes the player character's head. Teleporting resets the head to two places off default. Warning - if you change it to the 10th/8th head it is an invalid head and the game crashes. You can tell when this happens as you have a top half with brown hair and the bottom half is deformed. 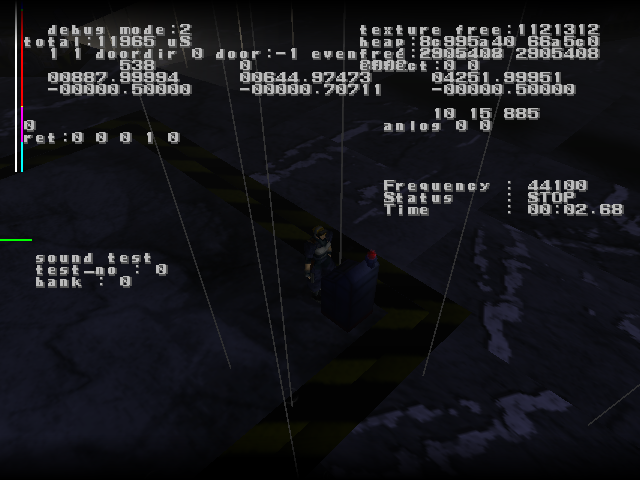 Using the analog stick and D-Pad appears to change values in the debug overlay but as for the effects, I do not know. A part from the debug options, many textures are different for the worse in this beta. It has awful place holder rain effects, different animations, no FMV, the intro is different and in Japanese only while the final game is in English by default. If you connect a second controller and put a VMU in the first controller, the game plays better. Originally it is very buggy and near unplayable but doing this you can actually play the game. You'll see unfinished story animations, rough text and incomplete dialogues through this beta. There are 4 ways this beta can boot. The first being the working beta, the second being the working beta but with a 10 minute timer. The third starts off as if it's the working beta but there's no rain apart from in the lights plus the actual carrier deck is a completely different design and very small. You can even walk right off it in to the blackness. The camera also stays pointing at your face in this mode. Finally there's the forth boot which is basically broken. The intro doesn't really work and you start the game in the middle of nowhere. It seems random on how the game will boot. Only the working beta can be played up to the first boss (Plant on a lift (Elevator)) but no matter what you do it won't die. There is a save feature in this beta but you can't load it back.